Home Pascal Dupuis Thaaaaaaaaaaaaaaaanks Pascal! After having his two previous seasons cut short by a torn ACL and blood clots, Pascal Dupuis has officially hung them up after the medical issues with the blood clots continued to persist. Originally acquired as part of the deal that brought Marian Hossa to Pittsburgh, it would've been far-fetched to think that Dupuis would still be in Pittsburgh nearly 8 years later. After finding himself playing on the Penguins 4th line at times, he found a place as Sidney Crosby's personal right winger following Bill Guerin's retirement. 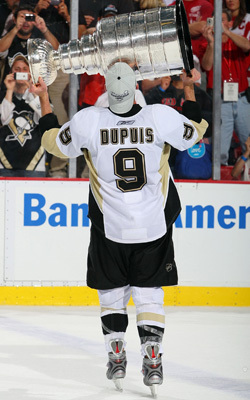 Always known as a good skater with good defensive ability, Dupuis began finding his scoring touch. Over his last 4 full seasons, he scored at least 17 goals and 37 points in each, numbers made more impressive considering that Dupuis received minimal time on the power play. He reached career highs in goals (25), assists (34), and points (59) during the 2011-12 season, and then proceeded to post even higher scoring rates the following year during. While the lockout robbed him of the chance of besting the numbers, he still posted 20 goals, 18 assists, and 38 points - totals that would have had him on pace for 34 goals, 35 assists, and 69 points over the course of a full season. Following that year and facing free agency, Dupuis re-signed with Pittsburgh as Ray Shero offered him a 4 year, $15 million contract. Unfortunately, the injuries mentioned robbed him of ice time after that, as he's proceeded to play just 73 of a possible 190 regular season games while missing both postseasons. We wish Pascal Dupuis all the best of luck in his retirement and health. He goes out a fan favorite even despite his play on the ice this season falling short of what we had become accustomed to seeing from him over the years. With his retirement, it's likely that Daniel Sprong will take his space in the lineup, and with his $3.75 million AAV coming off the books effective immediately, his retirement allows Jim Rutherford the flexibility in the salary cap to address a leaky blue line. Hopefully this doesn't mark the end of Dupuis' time in Pittsburgh and he manages to return to the organization, whether as a coach or a broadcaster, as so many former Penguins have over the years. Good luck Pascal, and thanks for the memories.